The worst chicken that I've ever had the misfortune of eating. Plain and simple. I'm black...TRUST me when I say I know good chicken. Please don't waste your precious money. I guess I should have suspected something was up when I ordered a Shrimp Basket for only $8. It was just plain terrible. It used minuscule frozen shrimp inside a lot of batter. I would have named the dish mediocre batter with a tiny tiny shrimp inside. The fries were not crisp at all and were barely warm. I ended up eating the plain white bread roll because the rest of the basket was so gross. Maybe the chicken is better. Have had a strange craving for chicken tenders recently so when I saw this truck near work I thought problem solved! I would have been better off sticking with the craving. The chicken tenders were flat (literally), dry, barely crisp, rubbery, roughly-triangular pieces of formed chicken. These were obviously purchased at Restaurant Depot or another bulk food warehouse. You could even see the ridges on the bottom where these things went through a conveyor belt before being frozen, packaged and unleashed on the unsuspecting denizens of DC. The meal came with a small container of Kraft Honey Dijon dipping sauce which may have been the best part of the entire package. They also have other sauces you can pour in little containers yourself. I tried the BBQ. It's pink. Don't make my mistake. I went with corn as my side. Come on, who can screw up corn!?! Tasty Fried DC can! The ear of corn was boiled for so long it was waterlogged and completely tasteless. Wrapped in foil to keep all that watery goodness inside! Don't let the photos on the menus deceive you. This is horrid food. I'm actually looking forward to eating a tube of Pringles just to try and forget this meal. Complete waste of money, energy and calories. I wish I could give them zero stars, but I guess one for the Honey Dijon will have to do. If I could give it less than a star, I would. Frozen chicken that's been nuked tastes better compared to these tenders. I was very disappointed at how dry, hard and tasteless they were. Sorry, won't try them again. Chicken was alright but my 3 piece meal came with a thigh and two wings... really unsatisfying. Chciken is so-so but when you specialize in fried chicken you expect a lot more. Wont be back and dont waste your money walk around and find something that is worth it like most of the trucks in DC. Chicken tenders were very small, chewy, and dry. For $10, I would expect something that tasted slightly better than frozen chicken nuggets from the grocery store. And the fries were cold. At least they were friendly. How Much Did It Cost? : Too Much! I had a terrible stomachache after having the fish from this truck but didn't connect the two until my husband was terribly sick yesterday and we realized that he had bought lunch from the same truck. I seriously believe that this truck gave my husband and I (along with one of his co-workers) food poisoning! Stay away from this truck; everthing they sale is overly greasy and they use old grease! To top it off the staff is also RUDE!!! Only giving them one star because it's required to post this review! 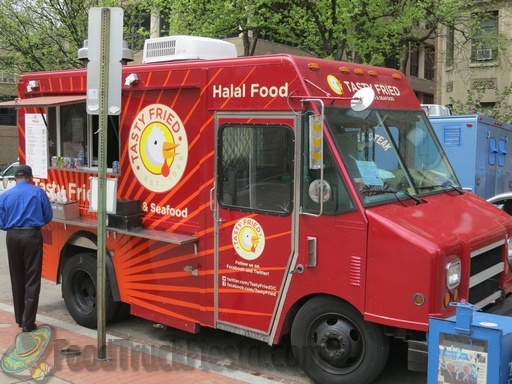 Tasty Fried DC food truck serves fried chicken and fish. It is brought to you by the makers of Tasty Kabob.